To Cite: Fazlalipour M, Mohsenpour B, Baniasadi V, Jalali T, Mohammadi T, et al. A Case Report of Crimean-Congo Hemorrhagic Fever Virus Europe-1 Genotype in the West of Iran, Iran Red Crescent Med J. 2017 ; 19(11):e14217. doi: 10.5812/ircmj.14217. Introduction: Crimean-Congo hemorrhagic fever (CCHF) is a fatal tick-borne viral zoonosis. CCHF virus (CCHFV) has 7 distinct genotypes with a determined geographical distribution pattern. However, similar genotypes have been reported from distant geographical areas. Case Presentation: On 4 June 2016, a CCHF suspected case from Sanandaj city, Kurdistan province of Iran, was confirmed with CCHFV infection by RT-PCR test. The phylogenetic analyses showed a strain belonging to Europe-1 genotype. Conclusions: Considering the similarity of Iranian strain of Europe-1 genotype to the strains from Turkey and Russia, it could be claimed that Europe-1 genotype has introduced to Iran from European countries. However, to have a better understanding about the circulation of CCHFV Europe-1 genotype in Iran, further investigations should be performed. Crimean Congo hemorrhagic fever virus (CCHFV) is a highly virulent pathogen that belongs to Nairovirus genus and Bunyaviridae family. Human infection occurs through infected Ixodid ticks bite (mainly genus Hyalomma) as well as unprotected contact with blood/tissues from viremic animals or patients. Ixodid ticks are reservoir of CCHFV and the virus circulates in ticks via transstadial, transsexual, and transovarial (1). Among viral hemorrhagic fever agents, CCHFV displays a wide geographic distribution as it has been documented in many countries of Africa, the Middle East, Asia, Southeastern Europe, and recently in Spain (2). According to the sequence of the S segment of CCHFV genome, the virus was categorized into 7 phylogenetic groups including 3 Africa, 2 Asia, and 2 Europe. Iran is one of the CCHF endemic countries with human cases of the disease reported almost all over the country (3). According to the previous data, 5 out of 7 lineages of CCHFV have been detected in Iran (1, 4). The broad CCHFV genetic diversity in Iran inspired us to investigate the circulation of CCHFV linages across Iran. Here we report a Europe-1 lineage for the first time from Kurdistan province, the western part of Iran. In June 2016, a 53-year-old shepherd was admitted to a general referral hospital in Sanandaj city, Kurdistan province (Figure 1). His symptoms included sudden fever (> 38°C), dizziness, myalgia, stomachache, ecchymosis, and petechiae. Laboratory analyses revealed thrombocytopenia (Platelet = 15000/ µL), leukopenia (WBC = 3000/µL), proteinuria, hematuria, elevated liver enzymes (ALT = 276 U/L, AST = 414 U/L, and ALP = 356 U/L), prolonged prothrombin time (PT = 16 Sec), and partial thromboplastin time (PTT = 70 Sec) (Table 1). The patient had a history of tick bite 10 days prior the onset of clinical symptoms. Abbreviations: ALP, alkaline phosphatase; ALT, alanine aminotransferase; AST, aspartate aminotransferase; PT, prothrombin time; PTT, partial thromboplastin time; WBC, white blood cells. According to the instruction of the National Expert Committee on Viral Hemorrhagic Fevers of Iran, the patient was subjected to the supportive and Ribavirin therapy, and his serum sample was sent to the Department of Arboviruses and Viral Hemorrhagic Fevers, Pasteur Institute of Iran (National Reference Laboratory) for laboratory diagnosis of CCHFV infection. To investigate CCHFV infection, IgM ELISA and RT-PCR tests were carried out as previously described (4, 5). Briefly, the IgM capture Enzyme Linked Immunosorbent Assay (MAC-ELISA) was carried out using inactivated viral antigen, diluted hyperimmune mouse anti-CCHFV ascitic fluid, horseradish peroxidase (HRP) conjugated secondary antibody and finally hydrogen peroxide (H2O2) and 3, 3’, 5, 5’tetramethyl benzidine (TMB). QIAamp Viral RNA extraction Kit (QIAgen GmbH, Hilden, Germany) and One-Step RT-PCR Kit (QIAgen GmbH, Hilden, Germany) were used for viral RNA extraction and RT-PCR. The sample tested positive for viral RNA and negative for IgM. The RT-PCR product (536 bp of S segment) was sequenced using an Applied Biosystems 3730/3730xl DNA Analyzers and the sequence was submitted to GenBank under accession number KX458022. Phylogenetic analysis was performed as previously described (4). As depicted in Figure 2, the isolate (Iran 4895) was grouped within the Europe-1 genotype. Phylogram was constructed using Maximum Likelihood statistical method and kimura 2-parameter substitution model with Bootstrap replication 100,000 as validation test. CCHFV shows a wide genetic diversity among arboviruses and based on the sequence of the S segment, the virus phylogenetically is categorized into 7 distinct genotypes including Africa-1, Africa-2, Africa-3, Asia-1, Asia-2, Europe-1, and Europe-2 (1). Although CCHFV genotypes display a limited geographical distribution, some reports indicate that similar genotypes may be detected in distant geographical areas. For example, recent studies have documented the circulation of Europe-2 related strains in the Middle East (4) and North Africa (6). 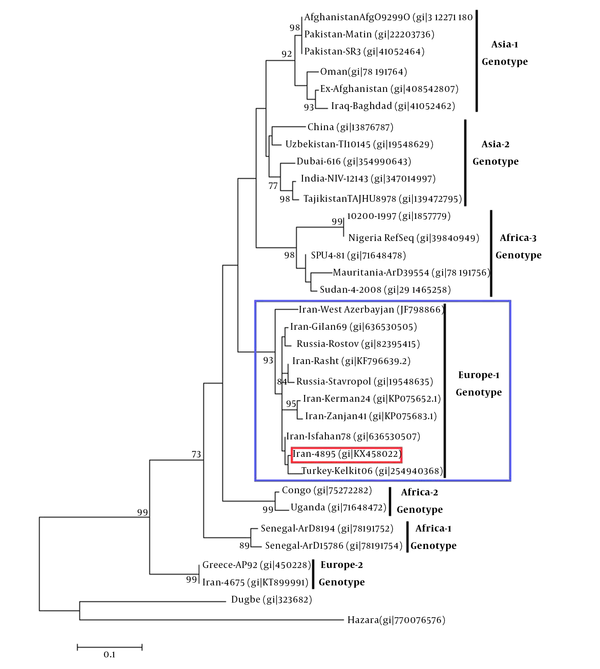 Furthermore, a closely related strain to Africa-3 genotype was reported from Spain (2). Considering that ticks could be transferred long distances by migratory birds as well as international livestock trade, observation of the genetic diversity of CCHFV in other endemic areas is not unexpected (7). In this study, phylogenetic analysis of the detected CCHFV showed a similarity to Europe-1 genotype. Previous reports from the north and northwest of Iran also documented the Europe-1 genotype of CCHFV (8-10). Considering the close similarity of strains of Europe-1 genotype from Iran with the Turkish and Russian strains (8-10), it could be hypothesized that Europe-1 genotype was introduced to Iran via migratory birds. However, to confirm this theory, collected ticks from migratory birds in the regions with reported Europe-1 genotype should be evaluated for CCHFV infection followed by phylogenetic analysis. Being a national reference laboratory report is the strength point of this study. The limitation of this study is its case report context, which does not provide comprehensive information about virus circulation. Disclosure Statement: The authors declare that there are no conflicts of interest. There were no sources of funding for this study. 1. Bente DA, Forrester NL, Watts DM, McAuley AJ, Whitehouse CA, Bray M. Crimean-Congo hemorrhagic fever: history, epidemiology, pathogenesis, clinical syndrome and genetic diversity. Antiviral Res. 2013;100(1):159-89. doi: 10.1016/j.antiviral.2013.07.006. [PubMed: 23906741]. 2. Estrada-Pena A, Palomar AM, Santibanez P, Sanchez N, Habela MA, Portillo A, et al. Crimean-Congo hemorrhagic fever virus in ticks, Southwestern Europe, 2010. Emerg Infect Dis. 2012;18(1):179-80. doi: 10.3201/eid1801.111040. [PubMed: 22261502]. 3. Keshtkar-Jahromi M, Sajadi MM, Ansari H, Mardani M, Holakouie-Naieni K. Crimean-Congo hemorrhagic fever in Iran. Antiviral Res. 2013;100(1):20-8. doi: 10.1016/j.antiviral.2013.07.007. [PubMed: 23872313]. 4. Salehi-Vaziri M, Baniasadi V, Jalali T, Mirghiasi SM, Azad-Manjiri S, Zarandi R, et al. The First Fatal Case of Crimean-Congo Hemorrhagic Fever Caused by the AP92-Like Strain of the Crimean-Congo Hemorrhagic Fever Virus. Jpn J Infect Dis. 2016;69(4):344-6. doi: 10.7883/yoken.JJID.2015.533. [PubMed: 26902209]. 5. Fazlalipour M, Baniasadi V, Mirghiasi SM, Jalali T, Khakifirouz S, Azad-Manjiri S, et al. Crimean-Congo Hemorrhagic Fever Due to Consumption of Raw Meat: Case Reports From East-North of Iran. Jpn J Infect Dis. 2016;69(3):270-1. doi: 10.7883/yoken.JJID.2015.498. [PubMed: 26743144]. 6. Kautman M, Tiar G, Papa A, Siroky P. AP92-like Crimean-Congo Hemorrhagic Fever Virus in Hyalomma aegyptium Ticks, Algeria. Emerg Infect Dis. 2016;22(2):354-6. doi: 10.3201/eid2202.151528. [PubMed: 26812469]. 7. Mild M, Simon M, Albert J, Mirazimi A. Towards an understanding of the migration of Crimean-Congo hemorrhagic fever virus. J Gen Virol. 2010;91(Pt 1):199-207. doi: 10.1099/vir.0.014878-0. [PubMed: 19812264]. 8. Chinikar S, Shah-Hosseini N, Bouzari S, Jalali T, Shokrgozar MA, Mostafavi E. New circulating genomic variant of Crimean-Congo hemorrhagic fever virus in Iran. Arch Virol. 2013;158(5):1085-8. doi: 10.1007/s00705-012-1588-0. [PubMed: 23271164]. 9. Chinikar S, Bouzari S, Shokrgozar MA, Mostafavi E, Jalali T, Khakifirouz S, et al. Genetic Diversity of Crimean Congo Hemorrhagic Fever Virus Strains from Iran. J Arthropod Borne Dis. 2016;10(2):127-40. [PubMed: 27308271]. 10. Morovvati A, Ghalyanchi Langeroudi A, Soleimani M, Mousavi-Nasab SD, Majidzadeh AK. 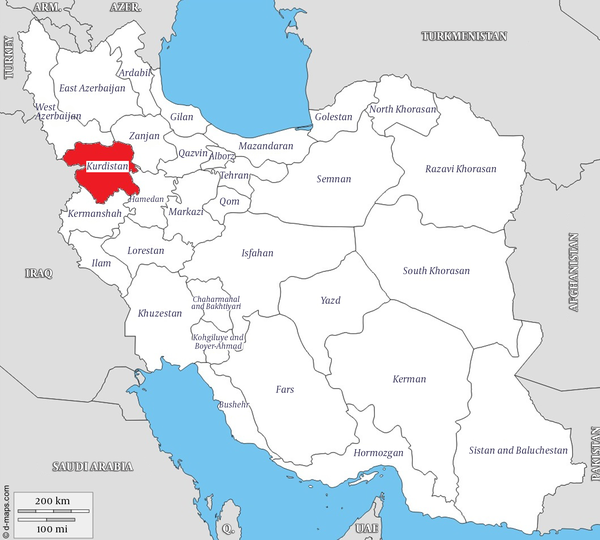 Emergence of a new genotype of Crimean-Congo hemorrhagic fever virus in Iran. Iran J Virol. 2012;6(3):24-9.